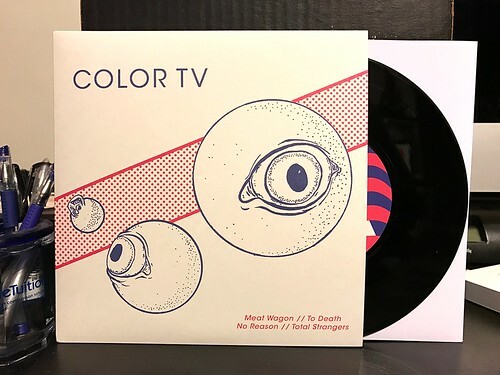 I Buy Way Too Many Records Dot Com: Color TV - Meat Wagon 7"
I picked up an album by a band called W.H. Walker a few years ago and over the years it has become one of my very favorite records. The way that album channels the band's infectious party energy is the sort of thing just just sticks with me. I've been clamoring for a follow up for years. Unfortunately, as is often the case, it seems W.H. Walker split up. Sad times for sure. However, in doing some good old fashion internet digging, I stumbled across a new band that sprung from their ashes: Color TV. I picked up Color TV's demo tape a few months back and thought it was a good time. Their first proper 7" is even better. Though I do miss the unadulterated fun of W.H. Walker, if you are looking for some straight ahead catchy punk rock, you aren't going to do much better than Color TV. They keep their songs fast and to the point in a way that isn't that sonically different from The Marked Men. Downstroke laden verses give way to bright singalong choruses making this a pretty killer 7" start to finish. This is a band that is absolutely off to a great start. I'm certainly eager to hear where they go next, though it also wouldn't bum me out if they decided to get W.H. Walker going again at the same time. There's plenty of room in this world for two great bands.